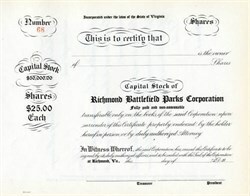 Unissued certificate from Richmond Battlefield Parks Corporation printed in 1927. This historic document has the company's name on top center and is over 89 years old. In 1927, the Richmond Battlefield Parks Corporation began assembling the original battlefield acreage; and in 1932 the corporation deeded all of its property to the Commonwealth of Virginia to become Virginia's first state park--the Richmond Battlefield State Park. That same year, a study done by the Secretary of War for the U.S. Congress determined that these acres were appropriate for acquisition by the War Department should they be offered for donation. The War Department study further recommended that an additional 1,905 acres of core battlefield land be purchased. The donation was ultimately accepted by federal authorities, but he recommendation regarding additional land acquisition was not acted upon. In 1993 the Congressionally chartered Civil War Sites Advisory Commission submitted its report that highlighted seven battlefields around Richmond in the list of the fifty most significant and most threatened battlefields in the country. This Plan is consistent with the recommendations of the Commission. History from the U.S. National Park Service and oldcompany.com.